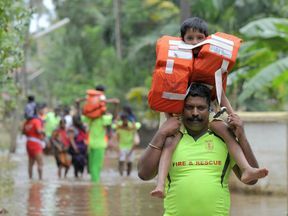 Aid workers have said they fear outbreaks of disease as thousands of people remain stranded after Kerala's worst flooding in a century. Thousands are awaiting rescue and an estimated 800,000 people have been relocated to 4,000 relief camps as waters continue to surge in the Indian state. "The scale of the calamity here is indeed very, very frightening," Devendra Singh-Tak, a spokesperson for Save the Children, told Sky News. "There are people who are scared to go back to their homes." As the severity of the rainfall begins to decline, aid workers fear that stagnant water could prove a breeding ground for diseases like cholera and malaria, and have warned of a chicken pox outbreak. They say some 10,000 people in remote villages could be cut off from medicine, food and water.